OvenStuff Non-Stick Set of 3 Cookie Pans Baking Sheet Baking Pan is currently selling at $16.44, approximately $1.91 lower than average, giving a potential saving of $3.55 right now. With a lowest price of $16.44 and an average of $18.35 it is selling on the low end of its usual range. Price volatility is 1.49% (meaning it does not change often), so the price should stay low for a while. Right now this product is a recommended 'fantastic deal'. The current deal is also the best price on this item over the last month. 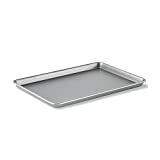 Compare the current price, savings (in dollars & percent) and Buy Ratings for the top Baking Sheets that are closely related to OvenStuff Non-Stick Set of 3 Cookie Pans Baking Sheet Baking Pan. 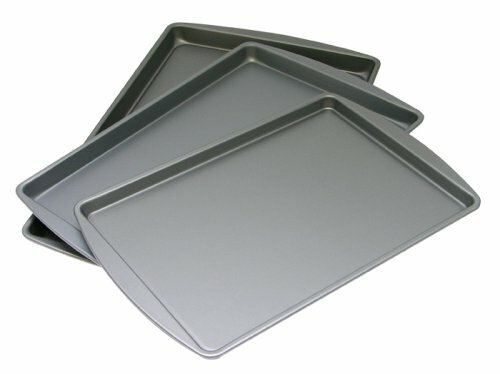 Here is how OvenStuff Non-Stick Set of 3 Cookie Pans Baking Sheet Baking Pan compares with other leading Baking Sheets. Each OvenStuff Non-Stick Set of Three Cookie Pans includes one large 17.2 inch x11.2 inch cookie pan, one medium 15.2 inch x10.2 inch cookie pan, and one 13.2 inch x9.2 inch cookie pan. Each cookie pan is coated with a DuraGlide Plus non-stick coating inside and outside of the pan. The non-stick finish allows cookies to release easily from the pan while making clean up a snap. The heavy weight steel construction ensures even heating across the pan for golden brown baking results. Pans are dishwasher safe. Proudly made in the U.S.A. FeaturesCookie Pan Set includes: 13.2 inch x 9.2 inch Small Cookie Pan, 15.2 inch x 10.2 inch Medium Cookie Pan, 17.3 inch x 11.2 inch Large Cookie PanDuraGlide non-stick finish inside and out of each pan allows baked goods to release easily from the pan while making clean up simpleHigh performance steel construction ensures even heating for optimal baking resultsMade in U.S.A.